On Facebook and Instagram I recently posted some highlights of a local home I got to work on. Sometimes with my e-design clients I don't always get to see the finished product. I get SO excited when I see my designs come to life! This time I got to work with the cutest family of 7! They were such a joy to and we aren't done YET!!! Before they purchased the home I was called to look over the home and see if it was something we could work with, that wouldn't require too much to fix design wise. What they should work on now, and what could be held off until later. I made some suggestions, and they gave me a call after they had moved in! We worked first on the entry and main living area. It was very important to my client that they had a nice place for their family, as well as for others. I feel we accomplished the goal. The home is easy for them to take care of, nothing is too precious, but it still looks stylish! 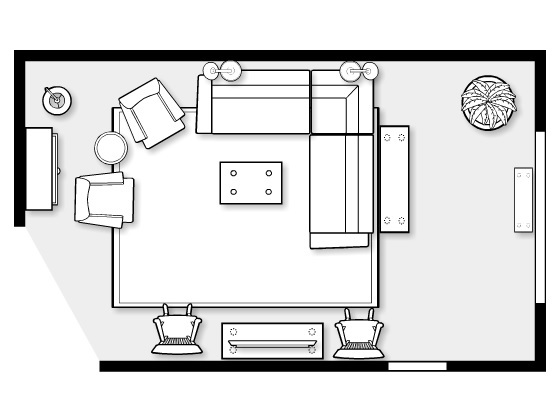 First was the floor plan. 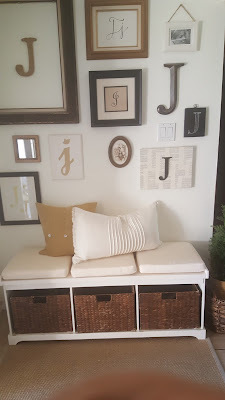 We worked together to come up with a fix for this awkward space that would house toys and could look pretty in no time! They requested a sectional and a place to hold some extra chairs from their kitchen dining area. 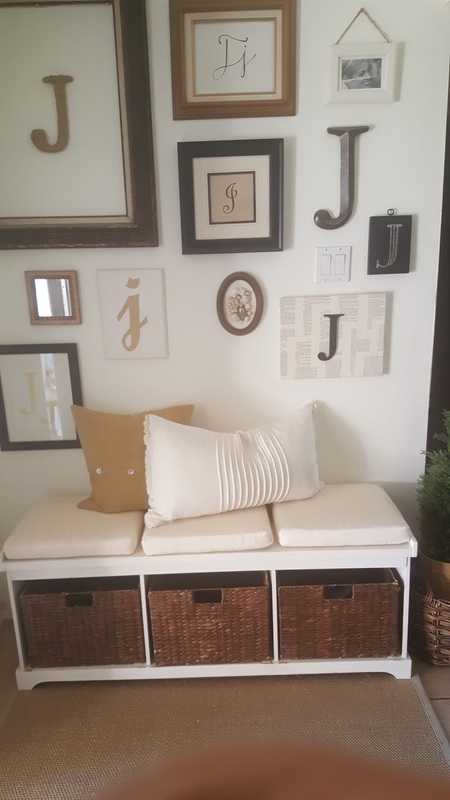 We incorporated some of their previous furniture with some updates, and added more storage where we could. The area on the right is for the kids to play and the sofa table houses baskets for a quick clean up! Next was the mood-board. 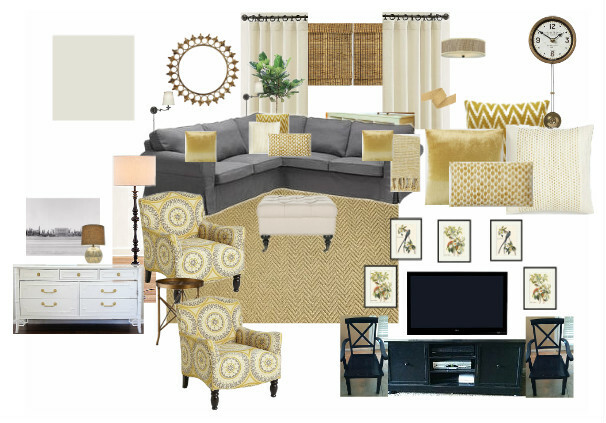 Although this client was local, I love to do these to help them get the vision of the space. We worked together with a shared Pinterest board of ideas. By going with the fixed elements throughout their home (St. Cecelia Granite) We were able to have a color pallet that looked fresh and let them keep the existing granite instead of over renovating. 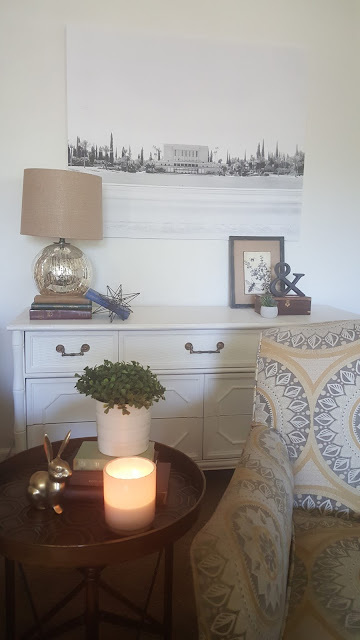 When my husband and I, and our 4 young children moved into our new home, it was obvious the place would need a lot of work before we could really call it our own! The colors, the layout, well so many things really just weren’t working for us. I called Annie, desperate for some help, and that is where the magic began. Annie asked us lot of questions and got to know what we were looking for when it came to design, function, and the general feel of each room. I was worried that the task would be too much to take on, what with a tight budget, and needing a very kid friendly, yet classy and well designed environment throughout. I wasn’t sure if our “dream” living spaces were even realistic with young children in the home, but Annie made it possible! After our consult, she came back with amazing idea boards that had everything that was important to us incorporated in them. I was blown away at how she was able to take our likes/dislikes and within days create these beautiful boards that had us speechless! It was obvious that she knew exactly what we wanted. She not only paid close attention to all the details in the colors/textures/function of each piece in the room, but she also took into consideration things that I would have never thought of like where the Christmas tree would best fit etc. She was always a step ahead, and planning for those things that had not even crossed our minds yet! Annie took us through each idea board and explained the functions and “why” of each item. She also sourced each one, so I knew exactly what I needed and where I needed to go to get it. Having her to work with took away all the indecisiveness that comes with the normally daunting task of choosing home décor. With Annie there was a plan, and we understood the beginning to the end and the why of it all. We were excited to do it right the first time! Having Annie’s idea boards and sources meant saving us money and time, as we would not be buying things not knowing whether they would work long term or not and we wouldn’t be caught painting coat after coat trying to find that perfect shade! 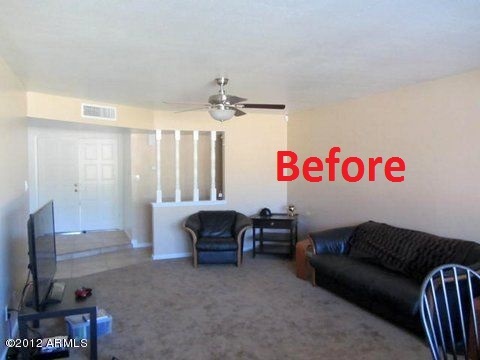 First on our list was our dysfunctional living room and entry, and boy it went through such a drastic transformation! 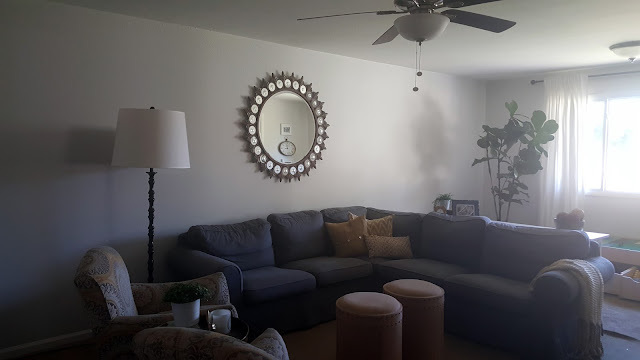 Thanks to Annie’s design and talent we were able to get that classy yet comfortable living area that is clean and inviting, yet kid proof and kid friendly, so there was no need to fuss over anything getting ruined or worn out. 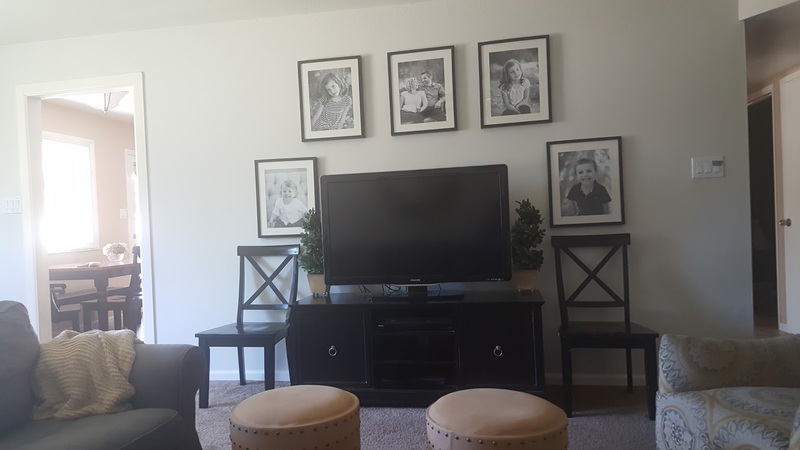 I love that my family room functions so well for my family now and that everything has its own space so that clean up is quick and easy and done in a matter of minutes. 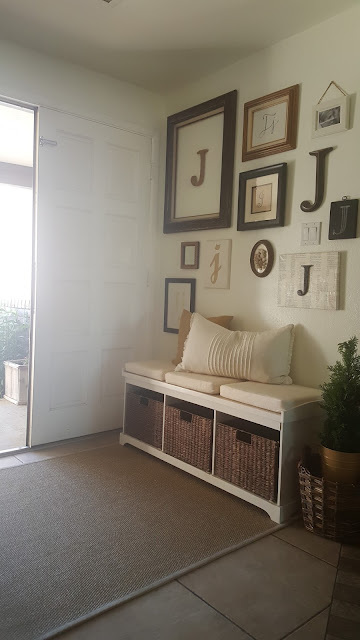 Our entry way is perfect! Thanks to Annie’s suggestions I was able to use some of my own creative talents along with her direction to make it unique and a true reflection of our family. I love inviting our friends and family to come over and relax in these areas, and I always get so many compliments when I do. I also love that after the effort and work we put forth to create these spaces with Annie (and do it right the first time), my family and I can just relax and enjoy them and I don’t have to worry about shopping for more decorations or trying a different shade of paint etc. It’s done and it’s perfect! I hope you guys enjoyed seeing a little of the process of the design of this project! Next up is their beautiful Master Bedroom! Thanks so much for leaving a comment! Got a question? Feel free to ask it in the comments and I will reply back here. Go forth and be happy! 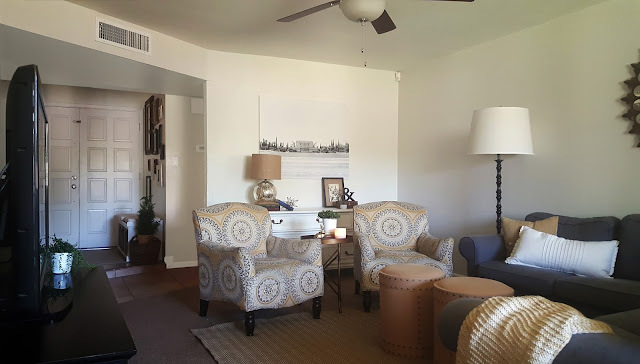 interior designer arizona, interior design, interior decorator, interior design arizona, interior designer gilbert, interior designer chandler, interior designer mesa, interior designer phoenix, interior decorator arizona, Annie Vincent Interiors, LLC. © 2014 Annie Vincent Interiors, LLC.. Simple theme. Powered by Blogger.